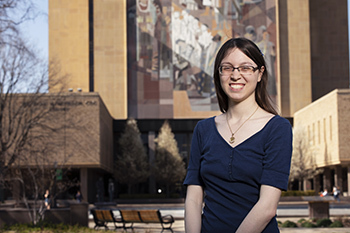 On May 4 (Friday), five undergraduate students from the University of Notre Dame received an Undergraduate Library Research Award (ULRA). This annual award is earned by students who demonstrate exemplary research skills and utilize a breadth of library services, resources and expertise for their research or creative projects. 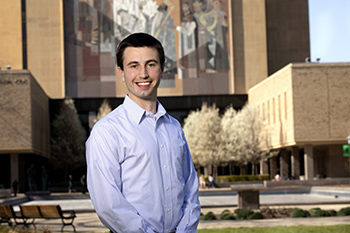 Tim Seida won first prize in the Senior and Honors Thesis category for his senior thesis, “What Does ‘Dr. Copper’ Say? An Analysis of Price Expectations in the Copper Market.” Advised by Christiane Baumeister, the Robert and Irene Bozzone Associate Professor of Economics, Seida analyzes the copper market price expectations that he says are an integral component for macroeconomic modeling and forecasting. By leveraging various databases, software and digital library resources, Seida was able to critically evaluate the accuracy and consistency of data for his research. His data evaluation uncovered an issue with finding reliable spot price data, which he learned was a recurring problem in literature. Laura Neis received an honorable mention in the Senior and Honors Thesis category for her senior thesis, “Rare Women and True Martyrs: Female Martyrdom under Queen Elizabeth I.” With guidance from her adviser, Rory Rapple, associate professor of history and a fellow at the Nanovic Institute for European Studies, Neis explored the sexist application of treason laws toward Catholics under Queen Elizabeth I. Due to the specificity of her topic, Neis had to seek specialized resources. Julie Tanaka, subject librarian in history, found her a rare manuscript located in the Westminster Diocesan Archives. Neis contacted the historian who was transcribing this manuscript, and he sent information critical to her argument that women were treated differently because of gender. 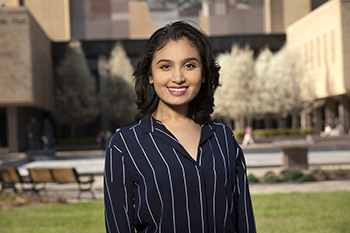 Gargi Purohit, junior, won first prize in the 20000-40000 category for her paper, “Getting a Seat at the Table and Keeping it.” Purohit’s economics professor and adviser, Kirsten Cornelson, prompted the class to outline evidence for a policy that reduces inequality. Purohit’s research examines the expansion of affirmative action for women and racial minorities. Purohit consulted with Leslie Morgan, Africana studies and education librarian. Morgan taught her how to effectively use the advanced search options when looking at peer-reviewed academic papers. She learned how to find databases and LibGuides that focus on her topic, which streamlined her research process. These resources helped her compile recent statistics on student population and racial composition of select colleges, and statistics on women and people of color in science, technology, engineering and mathematics. “With Leslie Morgan’s guidance, I was able to not only acquire the skills to find papers for my topic, but also learn how to apply those skills to future projects,” said Purohit. Nadezhda Braun, senior, received an honorable mention in the 20000-40000 category for her paper, “Representation of the Female Experience of the Soviet Era in the Poetry of Elena Shvarts.” Braun was advised by Emily Ambrose Wang, assistant professor in German and Russian languages and literatures. 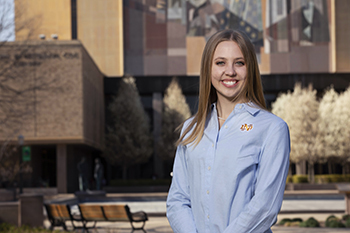 Freshman Kaleigh Brauns won first prize in the 10000 category for her paper, “Manufacturing Monopolies: Why Drug Manufacturers are at the Root of the Recent Rise in Pharmaceutical Prices,” where she explored the unethical nature of the prescription drug market. Brauns was advised by John Duffy, the O’Malley Director of the University Writing Program. In her ULRA essay, Brauns reflected on the challenges of writing a research paper and the steps taken to narrow her topic. She consulted with First Year of Studies Librarian Melissa Harden, who introduced her to the vast array of online services provided by the library. She explored databases, utilized the Interlibrary Loan service and consulted with the Ask Us Desk. For more information on the Undergraduate Library Research Award visit library.nd.edu/ulra. 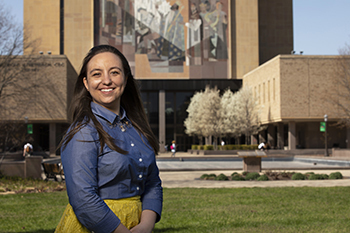 Originally published by Jenna Mrozinske at news.nd.edu on May 17, 2018.